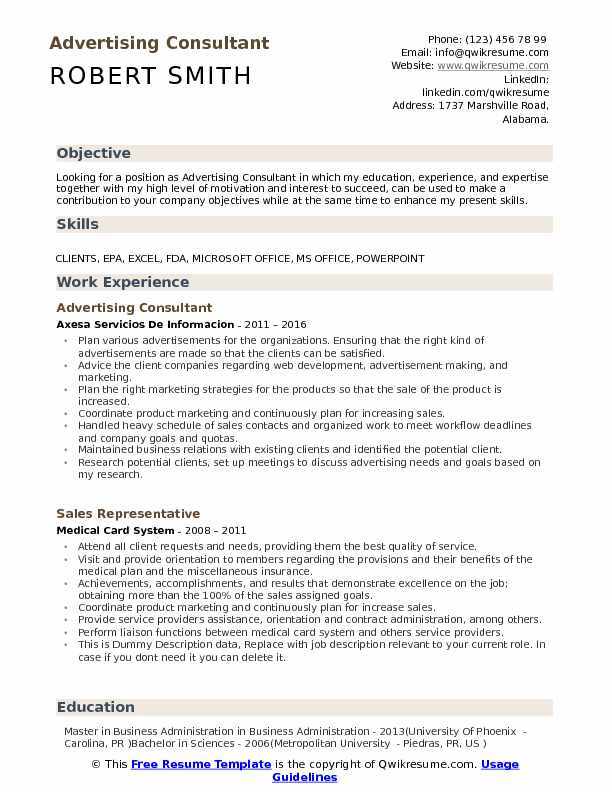 Advertising Consultants take charge of various responsibilities for the company they are hired. The typical job responsibilities shouldered on an advertising consultant are pitching new innovative advertising concepts, ideas and campaigns as a way to assist the company in bringing plans into focus, these individuals work closely with the company’s creative team and brainstorm to put ideas into vision. The advertising consultants work with the advertising director to generate new clients; a professional Advertising consultant plays a crucial role in promoting or depicting images and services offered by their clients. To become a successful advertising consultant the candidate should make sure that their Advertising Consultant Resume aligns with skills such as excellent networking capability, having a solid background in implementing advertising strategy with creative thinking. The required qualification for this job position is a Bachelor’s degree in Advertising, Marketing or Journalism. 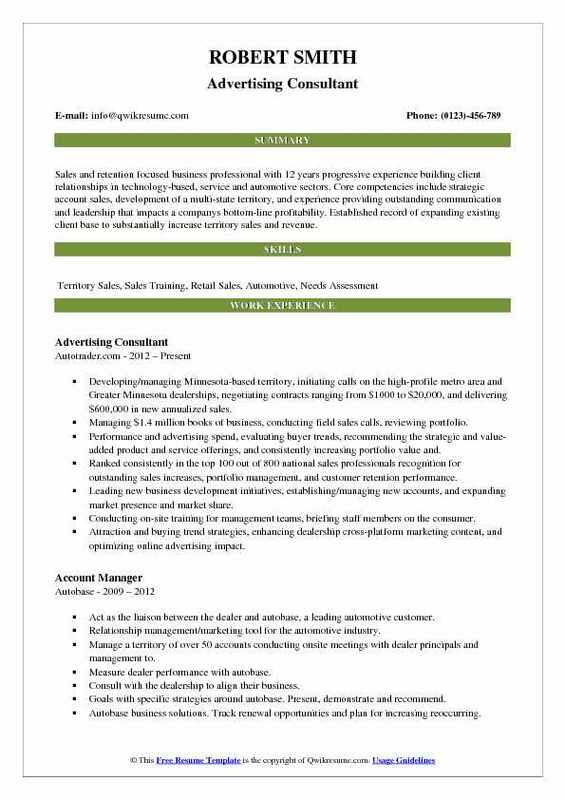 Summary : Successful, motivated, upbeat and extremely driven Advertising Consultant looking to utilize my sales and relationship building skills to help build value within the online media space. Manage $400k+ sales territory (annually), resulting in over $3 million in gross revenue. Perform detailed assessments of clients needs and structure comprehensive advertising programs. Selected by senior management to revise S.O.P. resulting in smoother workflow between sales and production. Introduced new digital media product offerings to the customer base, complimenting existing print/internet products. Design and develop advertising layouts to specifications for submission to the production department. Built solid long-term business relationships with key decision-makers, business owners, and advertising agencies. Work closely with advertising agencies to develop, negotiate and implement marketing programs for clients. Develop competitive pricing plans to retain/upsell existing customers and gain new clients. Utilize C.R.M. systems to maintain, track and increase customer base, leading to new opportunities. 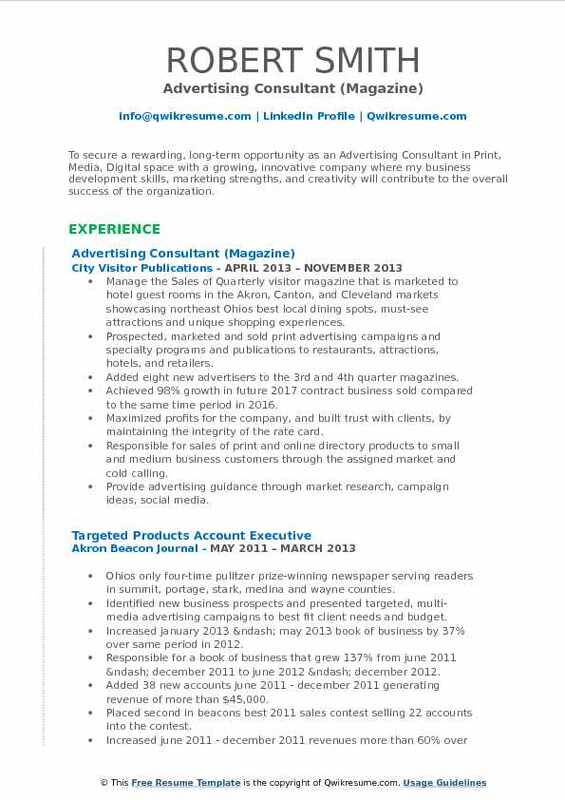 Summary : Advertising Professional with over 5 years experience in Media, Online and Information services industry. Utilize my proven skills and successful leadership experiences in management and sales to grow the business through example and leadership. 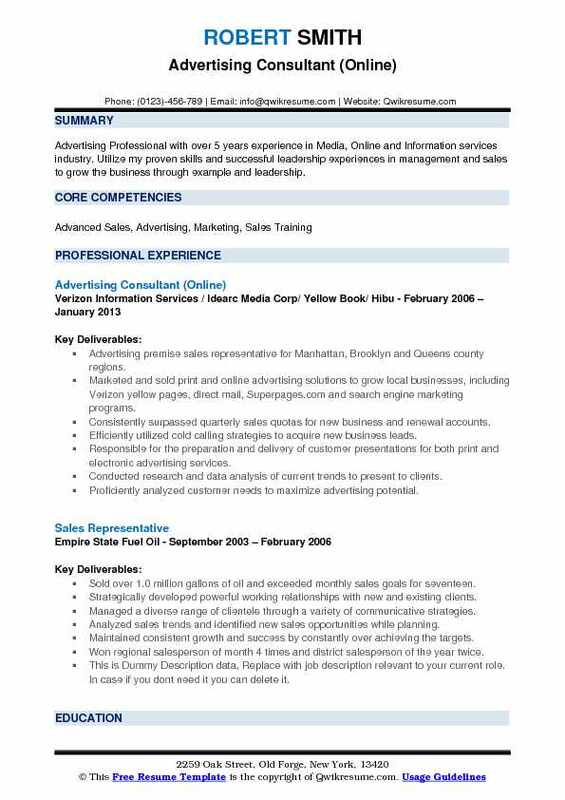 Advertising premise sales representative for Manhattan, Brooklyn and Queens county regions. Marketed and sold print and online advertising solutions to grow local businesses, including Verizon yellow pages, direct mail, Superpages.com and search engine marketing programs. Consistently surpassed quarterly sales quotas for new business and renewal accounts. Efficiently utilized cold calling strategies to acquire new business leads. Responsible for the preparation and delivery of customer presentations for both print and electronic advertising services. Conducted research and data analysis of current trends to present to clients. Proficiently analyzed customer needs to maximize advertising potential. Responsible for overseeing the completion of all contractual paperwork related to assigned accounts. Key accomplishments: 2014, 2016, 2017 - sales incentive award winner - spurt trip. Summary : Sales and retention focused business professional with 12 years progressive experience building client relationships in technology-based, service and automotive sectors. Core competencies include strategic account sales, development of a multi-state territory, and experience providing outstanding communication and leadership that impacts a companys bottom-line profitability. Established record of expanding existing client base to substantially increase territory sales and revenue. Developing/managing Minnesota-based territory, initiating calls on the high-profile metro area and Greater Minnesota dealerships, negotiating contracts ranging from $1000 to $20,000, and delivering $600,000 in new annualized sales. Managing $1.4 million books of business, conducting field sales calls, reviewing portfolio. Performance and advertising spend, evaluating buyer trends, recommending the strategic and value-added product and service offerings, and consistently increasing portfolio value and. Ranked consistently in the top 100 out of 800 national sales professionals recognition for outstanding sales increases, portfolio management, and customer retention performance. Leading new business development initiatives, establishing/managing new accounts, and expanding market presence and market share. Conducting on-site training for management teams, briefing staff members on the consumer. Attraction and buying trend strategies, enhancing dealership cross-platform marketing content, and optimizing online advertising impact. Developing and authoring sales presentations, researching competitive market intelligence, and negotiating strategic product pricing. 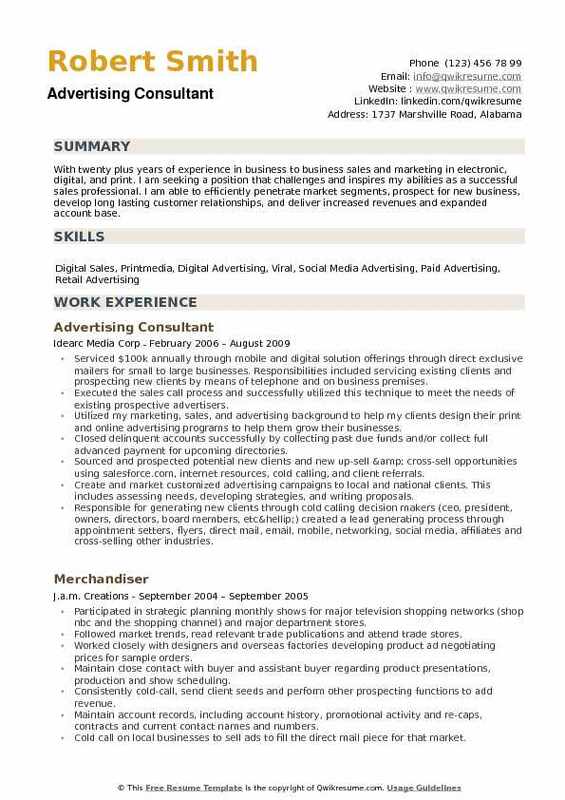 Headline : To secure a rewarding, long-term opportunity as an Advertising Consultant in Print, Media, Digital space with a growing, innovative company where my business development skills, marketing strengths, and creativity will contribute to the overall success of the organization. Manage the Sales of Quarterly visitor magazine that is marketed to hotel guest rooms in the Akron, Canton, and Cleveland markets showcasing northeast Ohios best local dining spots, must-see attractions and unique shopping experiences. Prospected, marketed and sold print advertising campaigns and specialty programs and publications to restaurants, attractions, hotels, and retailers. Added eight new advertisers to the 3rd and 4th quarter magazines. Achieved 98% growth in future 2017 contract business sold compared to the same time period in 2016. Maximized profits for the company, and built trust with clients, by maintaining the integrity of the rate card. Responsible for sales of print and online directory products to small and medium business customers through the assigned market and cold calling. Provide advertising guidance through market research, campaign ideas, social media. Objective : Dynamic, results-oriented Sales Professional with experience as a strategic sales executive specializing in client management, consultative advisement and leading revenue growth across multiple sales channels. Serve in a consultative capacity providing a host of online advertising solutions to franchise automotive dealerships in the Boston, ma market; service all accounts. Consult dealers on how to improve their performance through existing and additional solutions in the cox automotive product. Build relationships through bi-monthly face to face meetings and adding/teaching value through industry experience. Exceeded 2017 annual goal by 163% by soliciting new business and retaining existing accounts. Build weekly presentations and performance accountability with customers. Recap meeting with owners and general managers to hold all points of contact accountable. Accountable for revenue growth, new business development, account penetration, and client retention. 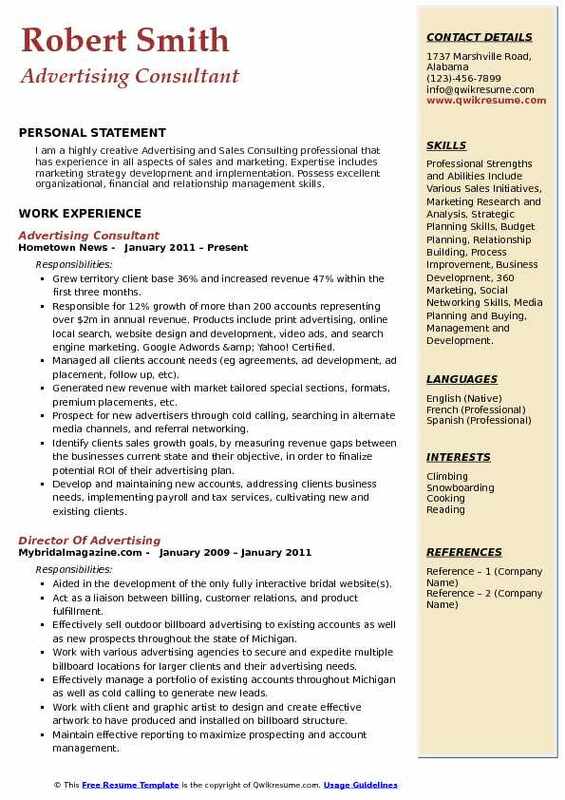 Heavy analysis and strategic presentation focused position advising clients to use their advertising dollars in a more cost-effective and impactful manner. Developed territory producing $130k monthly spend and superior client satisfaction. Summary : An experienced professional focused on increasing net new business and building successful business teams and business relationships. Provided monthly reports and analytics, showing online traffic, vdp / srps, pricing models, merchandising opportunities, engagement traffic, phone calls, emails, chat, and google analytics data. Responsible for generating revenue from a defined account list and prospect territory. Presidents club winner in 2016 - I was #19 out of 700 advertising consultants. Won Advertising consultant of the year 2017 award for Pennsylvania and Delaware. Selling advertising to customers. Helping to design and arrange the ad to benefit the customers. Face to face sales with customers as well. Consistently achieve sales goals in an assigned territory through developing/maintaining client relationships, cold-calling, up-selling, cross-selling, and prospecting. Serviced all customers needs from sales to retention and changes in customers needs with ongoing customer relationships. 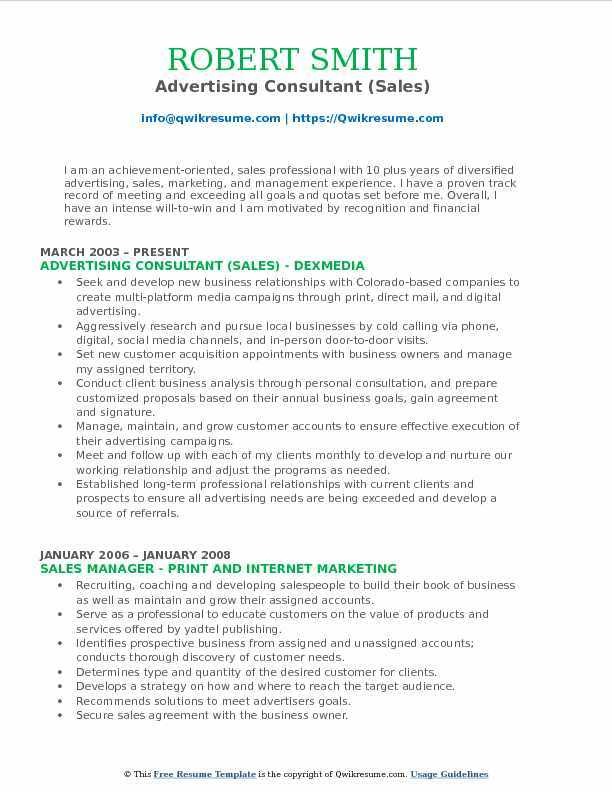 Summary : I am an achievement-oriented, sales professional with 10 plus years of diversified advertising, sales, marketing, and management experience. I have a proven track record of meeting and exceeding all goals and quotas set before me. Overall, I have an intense will-to-win and I am motivated by recognition and financial rewards. Seek and develop new business relationships with Colorado-based companies to create multi-platform media campaigns through print, direct mail, and digital advertising. Aggressively research and pursue local businesses by cold calling via phone, digital, social media channels, and in-person door-to-door visits. Set new customer acquisition appointments with business owners and manage my assigned territory. Conduct client business analysis through personal consultation, and prepare customized proposals based on their annual business goals, gain agreement and signature. Manage, maintain, and grow customer accounts to ensure effective execution of their advertising campaigns. Meet and follow up with each of my clients monthly to develop and nurture our working relationship and adjust the programs as needed. Established long-term professional relationships with current clients and prospects to ensure all advertising needs are being exceeded and develop a source of referrals. 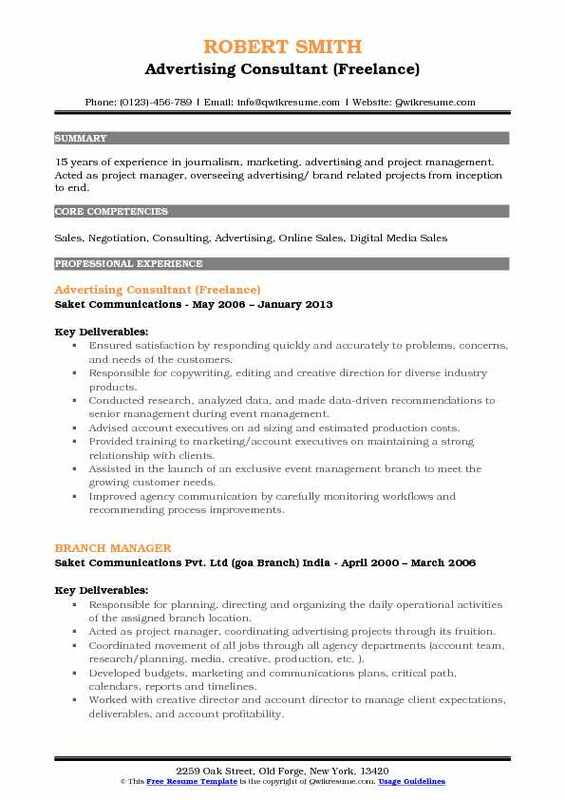 Summary : 15 years of experience in journalism, marketing, advertising and project management. Acted as project manager, overseeing advertising/ brand related projects from inception to end. Ensured satisfaction by responding quickly and accurately to problems, concerns, and needs of the customers. Responsible for copywriting, editing and creative direction for diverse industry products. Conducted research, analyzed data, and made data-driven recommendations to senior management during event management. Advised account executives on ad sizing and estimated production costs. Provided training to marketing/account executives on maintaining a strong relationship with clients. Assisted in the launch of an exclusive event management branch to meet the growing customer needs. Improved agency communication by carefully monitoring workflows and recommending process improvements. 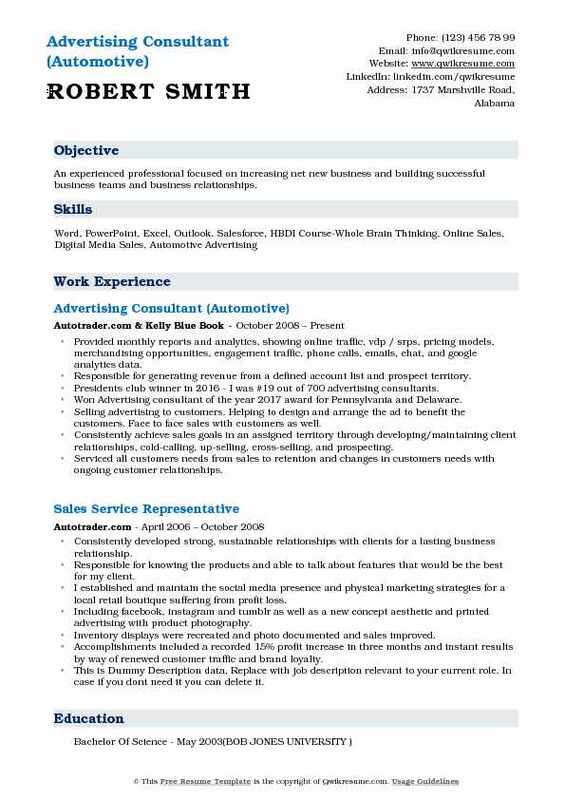 Summary : I am a highly creative Advertising and Sales Consulting professional that has experience in all aspects of sales and marketing. Expertise includes marketing strategy development and implementation. Possess excellent organizational, financial and relationship management skills. 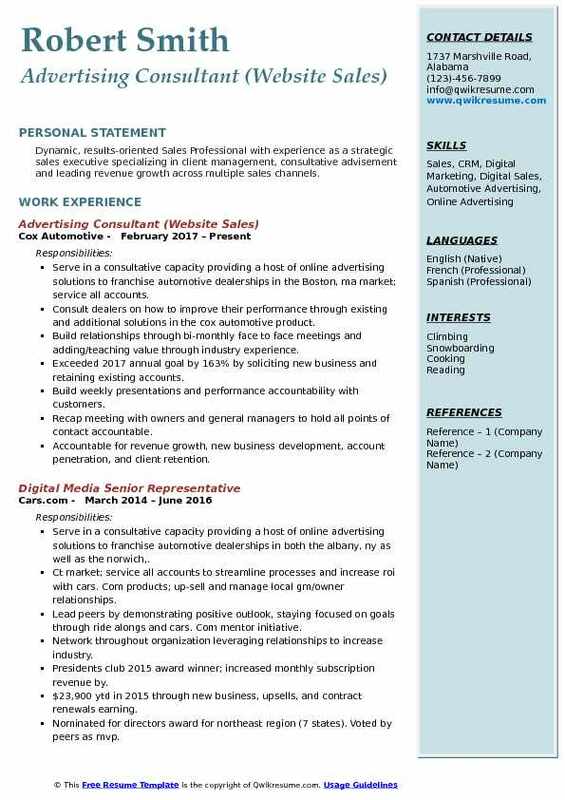 Skills : Professional Strengths and Abilities Include Various Sales Initiatives, Marketing Research and Analysis, Strategic Planning Skills, Budget Planning, Relationship Building, Process Improvement, Business Development, 360 Marketing, Social Networking Skills, Media Planning and Buying, Management and Development. Grew territory client base 36% and increased revenue 47% within the first three months. Responsible for 12% growth of more than 200 accounts representing over $2m in annual revenue. Products include print advertising, online local search, website design and development, video ads, and search engine marketing. Google Adwords & Yahoo! Certified. Managed all clients account needs (eg: agreements, ad development, ad placement, follow up, etc). Generated new revenue with market tailored special sections, formats, premium placements, etc. Prospect for new advertisers through cold calling, searching in alternate media channels, and referral networking. Identify clients sales growth goals, by measuring revenue gaps between the businesses current state and their objective, in order to finalize potential ROI of their advertising plan. Develop and maintaining new accounts, addressing clients business needs, implementing payroll and tax services, cultivating new and existing clients. Summary : With twenty plus years of experience in business to business sales and marketing in electronic, digital, and print. I am seeking a position that challenges and inspires my abilities as a successful sales professional. I am able to efficiently penetrate market segments, prospect for new business, develop long lasting customer relationships, and deliver increased revenues and expanded account base. Serviced $100k annually through mobile and digital solution offerings through direct exclusive mailers for small to large businesses. Responsibilities included servicing existing clients and prospecting new clients by means of telephone and on business premises. Executed the sales call process and successfully utilized this technique to meet the needs of existing prospective advertisers. Utilized my marketing, sales, and advertising background to help my clients design their print and online advertising programs to help them grow their businesses. Closed delinquent accounts successfully by collecting past due funds and/or collect full advanced payment for upcoming directories. Sourced and prospected potential new clients and new up-sell & cross-sell opportunities using salesforce.com, internet resources, cold calling, and client referrals. Create and market customized advertising campaigns to local and national clients. This includes assessing needs, developing strategies, and writing proposals. Responsible for generating new clients through cold calling decision makers (ceo, president, owners, directors, board members, etc…) created a lead generating process through appointment setters, flyers, direct mail, email, mobile, networking, social media, affiliates and cross-selling other industries. Worked with businesses to help with their sales and marketing methods by offering them a solution in a pre-bought-advertising solution, inventory purchase and cash advance when implementing our mobile marketing customer loyalty program they increased sales by 28% on average a year while helping them cut cost by more than 50% created and designed ads/mobile websites for clients. 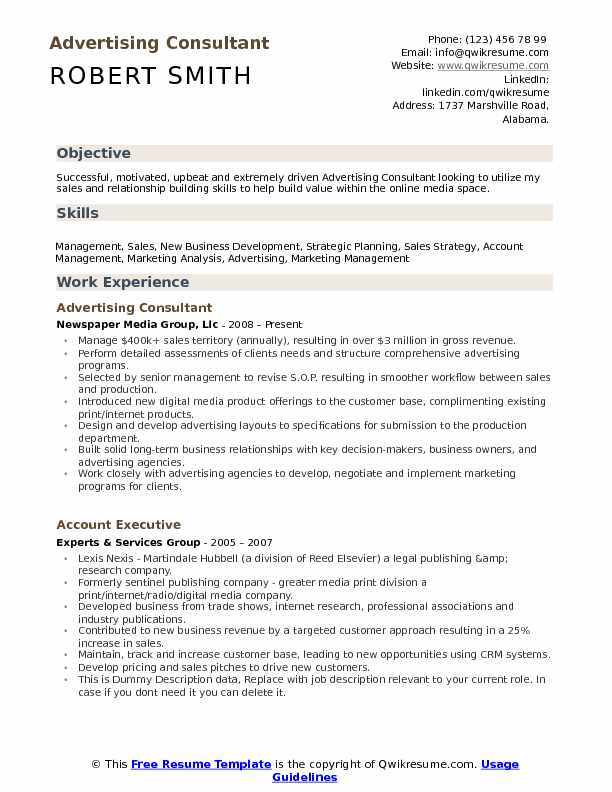 Summary : Looking for a position as Advertising Consultant in which my education, experience, and expertise together with my high level of motivation and interest to succeed, can be used to make a contribution to your company objectives while at the same time to enhance my present skills. Plan various advertisements for the organizations. Ensuring that the right kind of advertisements are made so that the clients can be satisfied. Advice the client companies regarding web development, advertisement making, and marketing. Plan the right marketing strategies for the products so that the sale of the product is increased. Coordinate product marketing and continuously plan for increasing sales. Handled heavy schedule of sales contacts and organized work to meet workflow deadlines and company goals and quotas. Maintained business relations with existing clients and identified the potential client. Research potential clients, set up meetings to discuss advertising needs and goals based on my research. Managing and upselling my current advertisers while providing excellent customer service on a daily basis. Study competitors products and services along with their advertisements to create the best campaign possible.